Taxes are a constant reality for small business owners. But instead of putting the fear of taxes up there with the fear of death—or avoiding the subject until you’re in trouble—it’s best to tame the small business tax beast head on with the help of a good coach. In this episode of the Go For Launch podcast, Diane Gardner talks about important business tax issues. Known as Your Tax Coach, Diane specializes in saving small business owners between $5,000 and $50,000 per year in 60 minutes or less through proactive tax planning. She has saved her clients over $417,000 in taxes to date. Listen to episode #12 of the Go For Launch podcast below. This episode is also on iTunes, Soundcloud and Stitcher. Diane is a licensed Enrolled Agent, which allows her to prepare income tax returns and represent taxpayers in all 50 states. She is QuickBooks Pro advisor, an Accredited Tax Preparer, and a Certified Tax Coach. Diane is also the best-selling author of several books including Stand Apart and Why Didn’t My CPA Tell Me That? She recently released her fifth book, Stop Overpaying Your Taxes! 11 Ways Entrepreneurs Overpay and How to Stop It Now! SiteGround is a top web host for startups — with plans starting at just $3.95 per month. Get lightning fast support online and by phone, 24×7. 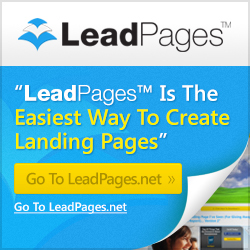 LeadPages is the fastest and most tested way to create landing pages, as well as pop-up sign up forms and more.